Today went to change money for my Singapore trip. I called my mom to ask her if she wants to go. She said she wanted to go Cold Storage. So I said ok.. Went and park at Ikano because I didn't want my Mom to walk far. Yes.. I did think about parking at Tesco coz it is free and i need to go there. But then Mom is more important. So i told mom "you go cold storage and I will walk over to Tesco coz the money changer at Tesco give better rate." It is quite far walk from Ikano to Tesco as you have to go thru The Curve. From Ikano to the Curve it is all covered but from the Curve to Tesco there is an open area. Just as I was going to cross it rained very heavy. What to do chinese mah... so no choice had to run across getting wet. Then had to run back because Mom and car still at the The Curve as I come back the rain was heavier. Was it worth it.... Well... I managed to save RM 5 for the rate. but spend RM 2 on parking and got wet and had to walk very far. So what you think !!! Then I went thru the list of people that I can ask to come with me. NY - because I know she would love to come with me.. esp since she found this great place to shop and Moss burger. But then her mom is in hospital and is recovering. So for sure she can't come. If it was last week all these ppl except for Li Mae would have been 1st one to put their hand when I say let go spore. Such lousy timing. 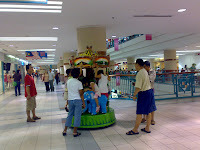 I was at one utama over the weekend. As usual the place was full of parents with their kids. There was this extended family with alot of kids. 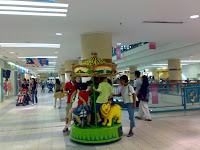 well there was this carousel thing where you have place for about 3 kids. Look what this family did. It is really maximizing your money. They had about 8 kids there. Well at least they paid for abt 3 rounds. Lucky the carousel didn't break.